Originally published at Secret Agent Audio Services. I just found an amazing EQ plugin the other day that costs less than $25. It’s made by this little Italian company called Hornet, and it’s called SW34. It’s an analog modeling emulation of the EQ section of some early ’80s console—I can’t remember which one offhand, although I know it says on their website if you’re curious. It’s no secret that I’m a huge fan of saturation, for all sorts of reasons: compression artifacts, non-linear EQ-related effects, general sonic enhancement and/or degradation. The trick with the saturation on this, as far as I can tell, is to run the input solidly into the red. Like, park it in the red. The channel in question will girth right up. It’s a solid state sort of vibe, more chunky than gooey. I was doing an informal master on something for a friend the other day, and I was having a bit of trouble getting the vocal to pop without sounding overbalanced or aggressive. I went through a bunch of EQs, and nothing felt good. Then I put this on the mix, put the upper mid frequency at like 2.5KHz, set the Q to wide, and just nudged the upper mid gain clockwise ever so slightly. I thought I was going to need to go way further than I did. Just a touch of it and the vocal opened up, but without any sort of associated stridency. Just this wonderful presence. I couldn’t have used more than half a dB. I’m not even certain you’re supposed to be putting this on the master bus. It sounded great though. 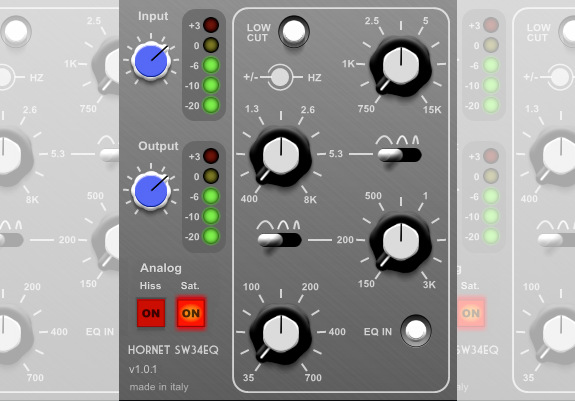 Independent in/out buttons for engaging or defeating the saturation emulation—and also the hiss emulation! So many plugins would benefit from this. I get that in order to make a complete and honest emulation, it’s important to include the hiss. I also think that more manufacturers should acknowledge that we don’t always want our mixes covered in hiss, or to have to do hiss mitigation, in service to their 100% accurate emulations. Being able to defeat the hiss and still have the saturation is genius. Or, alternately, being able to have that nice friendly hiss drifting away up there while maintaining the non-saturated integrity of your signal path. All kinds of good options. The low end is really tight. Again on that mastering-type situation, I found myself putting the low shelf at like 45Hz and cranking it. The mix I had in front of me was a little skimpy on the low end; no more. But it didn’t get boomy or woofy. Just big. 18dB/oct at I think 45Hz? Just high enough to affect only the very bottom end, just tight enough not to have undesirable reciprocal effects in the low mids. Did I mention it’s €18? So worth it. Jamie Hill is a record producer and music engineer, currently living and working in Los Angeles. He was nominated for Best Producer in the 2014 Independent Music Awards, and is married to singer-songwriter and house concert pioneer Shannon Curtis. Jamie can produce or mix your record. Contact him at jamie@secretagentaudio.com. That looks really cool. I’m going to check it out asap. Thanks for the tip. In a similar style–are you familiar with the Massey plugins; cheap, great sounding, and creatively featured. I use them a lot. BTW, looks like a late 60s API maybe?